Last November I had a surprise family session for a grandma's birthday. My client Julie called me from Texas to schedule a session because all of her family was flying into Michigan to surprise her mom. The grandma's birthday was not until March, but with the Thanksgiving holiday all the family and grandkids would be there. 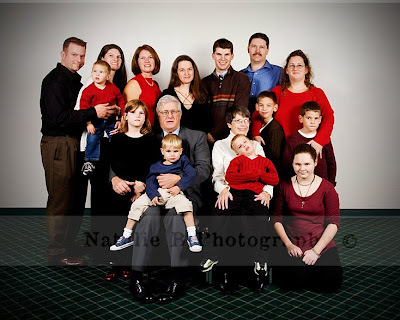 I ended up photographing the individual families, grandkids etc. Everyone was so nice and then the grandparents arrived at the country club. We quickly did their entire group in front of 100 guests. I only briefly got to meet them before they were to enjoy spending time with all of their friends. The session went well for inside a country club and my studio lighting. The family ordered Christmas cards and several prints for everyone. Just a few weeks ago the grandma ordered quite a few more prints and I went to deliver them to her today. Upon delivering them she told me how her husband had died in December, not long after the family session. She was so grateful that they had had the opportunity to have a family portrait session. I had no idea that he had passed, and as a very emotional person I tried everything I could to not cry. Unfortunately if you get to know me, you will know that never is the case, I tend to tear up pretty easily. The grandma explained what happened and my heart just went out to her. She said that they had not had a family portrait in over 20 years, she had promised the kids she would never make them do that again! She was now so happy that she had this portrait though. I am sharing this with you because I want you to know how very very important it is to have a family portrait done. I am not even saying that you have to have it done professionally but make sure you do some time. You will never regret it if you do. I know that we all make excuses, not enough time, not enough money, need to lose weight, when the kids are older etc. You never know when you are going to lose someone precious in your life. Having the recorded memories means so much to you. I encourage you, if you have never had a family session or it has been a long time please consider booking one. You will be so happy that you have those memories. And Judy if you read this, I am so sorry I lost it today! I really enjoyed meeting your family and feel so blessed that I was able to record those precious memories for you. Oh I would have totally lost it! It is so wonderful that you were able to capture that moment for them though. I'm sure she will always treasure those pictures! A similar incident happened with a coworker of mine. She had their family picture taken in Nov. and her husband was in an accident in Jan. She had a 3 and 1 year old. It was after that, that I've been making sure we take a family picture every year. Even though it is a lot of work and very caotic!